Masakayan has won 47 beach event titles, including a 2001 domestic crown in Santa Barbara with Dianne DeNecochea. Masakayan finished the 2001 season with $46,535 in earnings and four �final four� finishes in 14 starts. Masakayan and DeNecochea placed ninth in the 2001 FIVB Beach Volleyball World Championships in Austria. The pair captured the Bronze Medal in the 2001 FIVB season finale in Brazil as Masakayan announced her retirement from international competition. Masakayan captured the first women�s pro beach of the millennium with Elaine Youngs in February 2000 at Vitoria, Brazil. The pair also won the Bronze Medal at the 1999 FIVB Beach Volleyball World Championships in Marseille, France. Masakayan teamed with Karolyn Kirby to win 26 domestic events and three international events, including the 1994 Goodwill Games. Masakayan was the WPVA's 1992 Most Valuable Player, co-MVP in 1993, Top Defensive Player in 1991 and 1992, and Best Hitter in 1993 and 1994. Masakayan won the Most Inspirational Award in 1995 as she was recovering several knee surgeries. 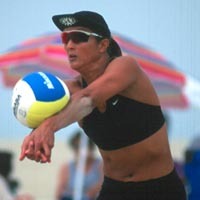 A four-year volleyball letter winner at UCLA (1982-85), Masakayan was a two-time All-American and played on the school's 1984 NCAA championship team. Masakayan was the 1984 Broderick Award winner and UCLA's 1985-86 female Athlete of the Year.